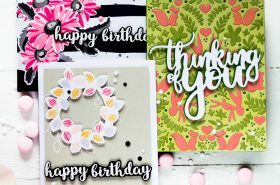 Today I’m honored to join Spellbinders October 2017 Blog Hop, celebrating release of 3 new collections: Spellbinders Classics, September Die D-Lites and Seth Apter Collection #4. 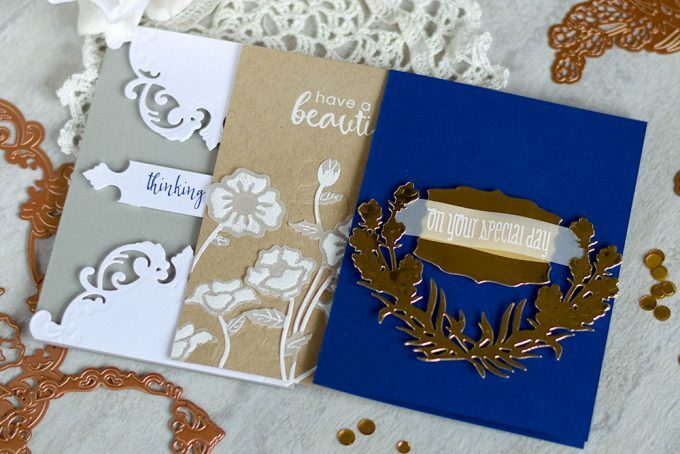 You probably came from Kimberly Crawford If not – you may consider starting from the beginning at Spellbinders Paper Arts and see what other designers sharing using products from new release. I made tree cards using newly released dies. For my first card I used very beautiful and extremely elegant Spellbinders Shapeabilities Eau De Lavande Label Etched Dies. I used the biggest label and die cut it out of Solar White cardstock using Platinum 6 die-cutting machine. Then I made an A2 card out of Pale Gray Cardstock, trimmed the bottom and top parts of the label and foam mounted them onto the card base. I also made a label for the sentiment using the same die. I used partial die-cutting technique to make it of a smaller size. And then I cut a stripe from it, stamped the sentiment and foam mounted in the middle of the card. First I die cut a lavender swag using Spellbinders Shapeabilities Lavender Swag Etched Dies as well as a label using Spellbinders Shapeabilities Eau De Lavande Label Etched Dies out of Gold Mirror Cardstock. And I made an A2 card out of dark blue cardstock. I foam mounted the label onto the card base. And also white embossed a sentiment onto a vellum stripe, adhered it behind the swag (between its branches) and foam mounted the swag onto the card positioning the sentiment in the middle of the label. One type of the cards I often make feature kraft cardstock, vellum and white embossing. This is a winning combination and I tend to make such cards pretty often. For my last card I first made an A2 card base out of kraft cardstock and dry embossed the floral design in the bottom part using Spellbinders Shapeabilities Poppies Etched Dies. Usually dry embossing with dies gives pretty significant indentation. I flattened it a bit bu running my card base through die-cutting machine with several sheets of thin printer paper as a shim. Then I die cut several poppies out of vellum, applied embossing ink through the die design and white embossed it. And I added some more details using Versamarker (stamps, leaf veins) and also white embossed them. Following by adhering them onto the card. Lastly I white embossed the sentiment in the top part of the card. To celebrate this release, Spellbinders is giving away a $50 gift certificate to FIVE lucky winners. Please leave a comment on Spellbinders blog by Thursday, October 19th 11:59 pm EDT for a chance to win. The winners will be announced in the blog hop post on Spellbinders blog the following day. I will also randomly choose a winner from comments left on this post and the prize will be $25 gift certificate to Spellbinders shop. Please leave a comment on this post by Saturday, October 21th at 11:59 PM EST for a chance to win. I will announce the winner here in this post on Sunday, October 22th. The winner of $25 Gift Certificate is Debbie B.
I will email the winner instructions of how to claim your prize. 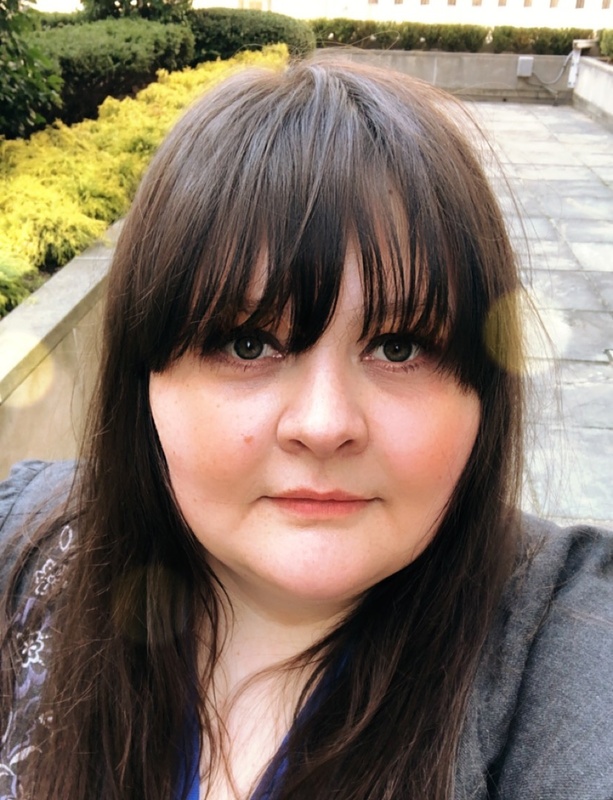 The next stop in the blog hop will be amazing Julia Stainton. If you got lost, please go back to Spellbinders Paper Arts blog. 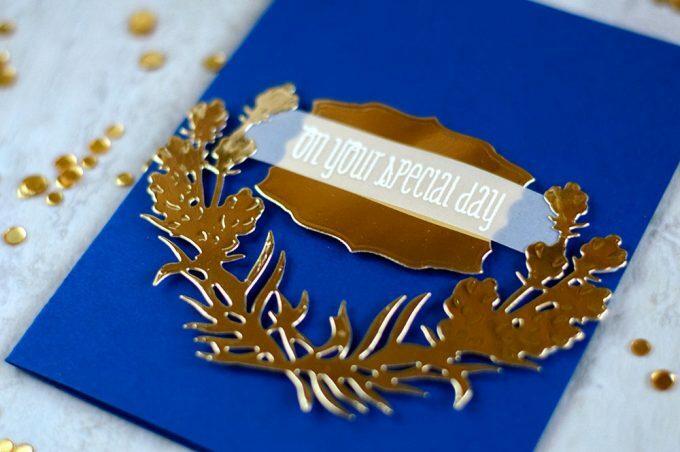 AWESOME cards, Great Release, I especially love your Have a Beautiful Day card on kraft! 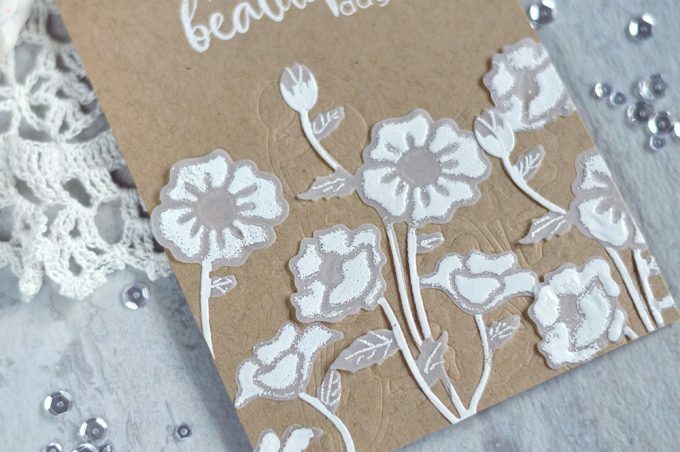 Your floral card is really beautiful – I love the use of vellum. They just keep getting prettier! I love the look of the white + vellum+ kraft. I have always liked white pigment ink on kraft, but I guess it won’t dry too well on vellum. This is gorgeous. Thank you. I am going to be looking at a lot of these dies with different eyes. Simple and pretty! Great Cards! Such beautiful cards. I especially love your ‘corporation’ card, so very elegant. Lovely, elegant, clean cards that really make the beautiful dies pop. Gorgeous cards! I especially love that poppies one. All beautiful! All of your cards are beautiful and I could relate to each of them. However, I love “have a beautiful day” the most. I need to get these dies! Beautiful cards! Nice and refreshing way to think about dies again! 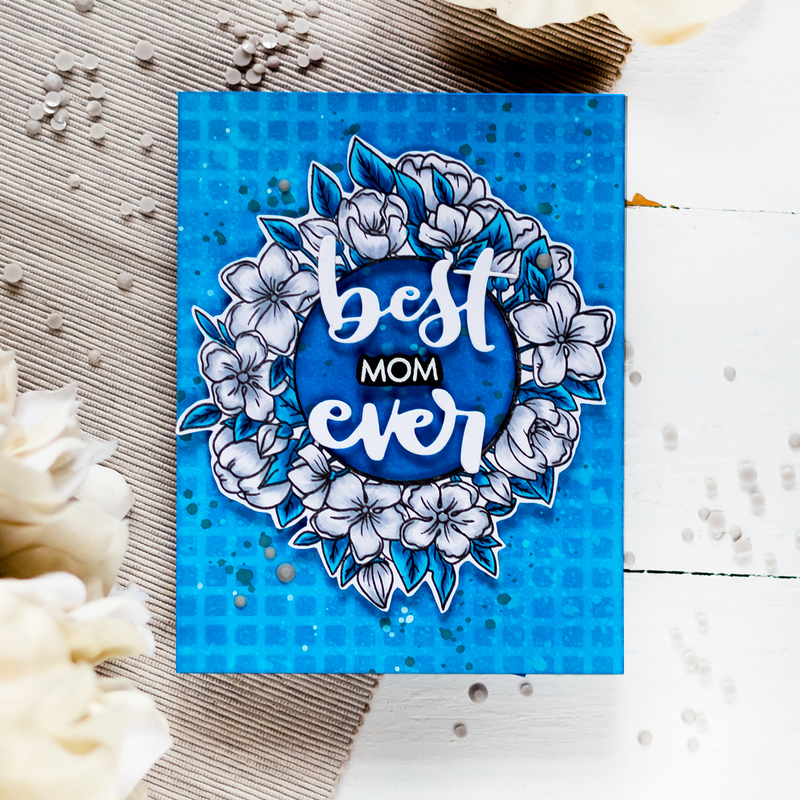 Spellbinders has some fantastic dies in this release! Awesome blog hop with so much talent! Thanks for sharing yours! going to be needing that die set! I’m thrilled with the way these dies look! So crisp and detailed. your cards are all beautiful!! Your floral is my most favorite.Im in awwww what this machine can do.Thank you. What a beautiful trio of cards! I love how each one is so different from the last one yet all are beautiful! That is the beauty of Spellbinders dies! They inspire you and make you want to find all of the different ways to use them! TFS! 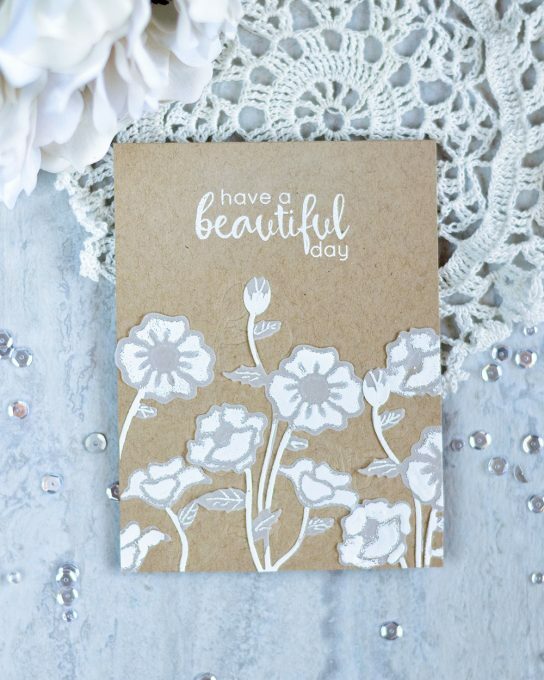 Love the “Beautiful Day” card……such an interesting effect using the dies to dry emboss with….and love how you embossed on vellum using the dies as a stencil. Very creative. Beautiful dies and the cards are amazing! 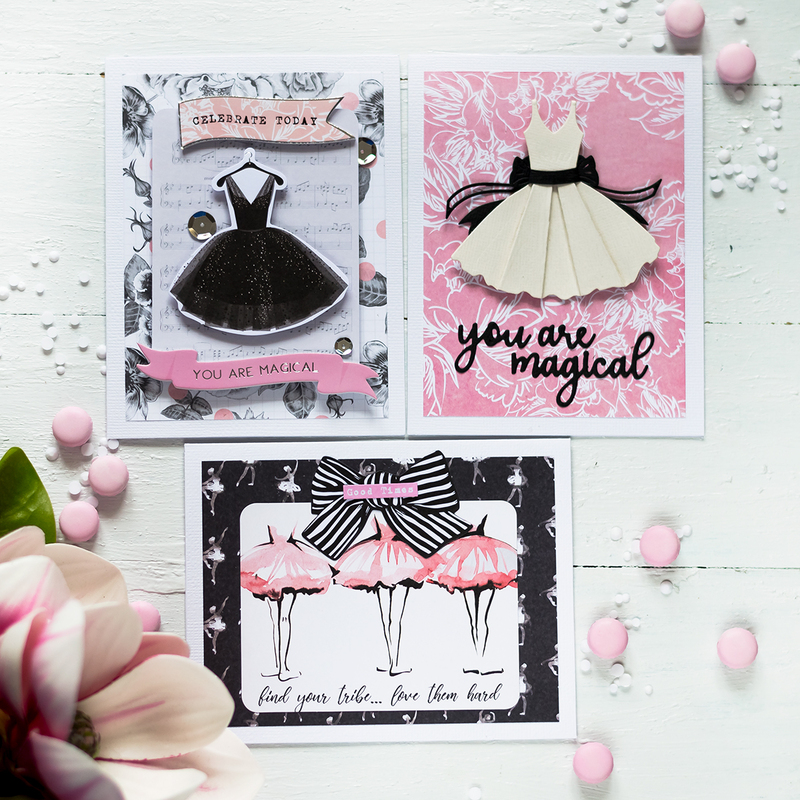 three lovely cards, Svitlana – wonderful designs and colors!! Beautiful cards! Love these pretty dies! The gold paper is so pretty, really adds an elegant look! Your cards are fabulous. Love the dies. Especially love the kraft card with white flowers. I’m not playing this game anymore, I’m not wasting my time entering comments on everyone’s blog to win $50 gift certificate, this practise is ridiculous. I love crafting just like the next person but I will no long be held hostage. I’d like to unsubscribe but can’t find an unsubscribe button. Lori, I’m sorry that you fell this way. The last thing I want to hold hostage. I myself only subscribe to blogs when I’m interested in content provided. Not just to track giveaways. If you’re subscribed by email you can easily stop receiving them by clicking unsubscribe link in any email (it’s located at the very end of each email). Lovely cards, great colour choices! I love the embossing on the poppy card, very subtle but helps make the card. I learned so much looking at how you made your cards, one die in so many different and beautiful ways. Beautiful cards! The vellum flowers are so soft and pretty. Love the mirrored cardstock! I love how simple but very elegant your cards are. They are lovely. That commenter who felt she was held hostage was very rude. I’m sorry she attacked you that way. It’s simple enough to enjoy the cards and ignore the giveaway. They are after all very pretty cards! Fantastic cards, love them they are all very elegant. Great dies and a fantastic collection. When growing up I was taught ‘if you have nothing nice to say don’g say anything at all’ and that person did not have to comment, she is ver rude. Lovely cards thank your for sharing. Love your response to the unpleasnt comment. Beautiful cards, thanks for showing the products you used..l.love that thank you card! Beautiful cards! I especially love the one with the poppies – probably because they are my favorite flower:) Thank you for sharing your talent with us! Wonderful cards! Love the Spellbinders with mirror cardstock. Nice cards, my favorite is the one made with craft paper and poppies. 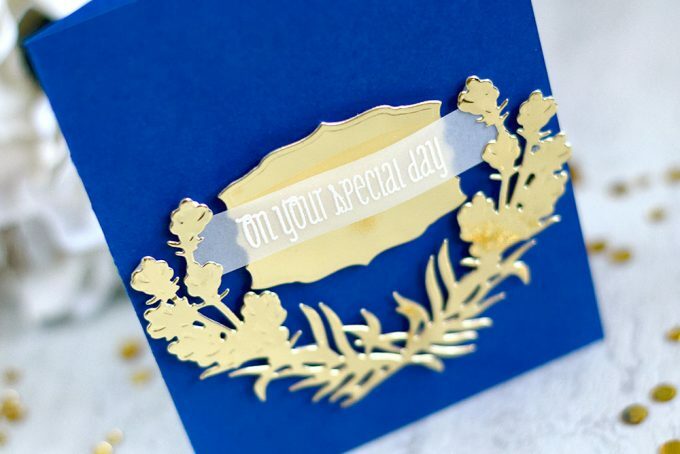 LOVE, LOVE, LOVE the blue with gold card…..very stunning. What beautiful cards you have created!! And I am more than happy to try for a chance to win! I appreciate your hard work and the generosity of the companies! All three of your cards are lovely, but the vellum poppies on kraft cardstock are just spectacular! Thanks so much for sharing! Each one of your cards is simply beautiful in its own way!! Love them all. All the cards were terrific but wow I loved the last one. It was so soft and so lovely — the stamps, the composition, the use of so much white. Very wonderful! Your cards are all so lovely. I am a huge fan of white on kraft so that’s my favorite. Beautiful cards, I especially love the Have a beautiful day!! I love seeing vellum in projects as well, it brings such a softness to projects:) Thank you so much for sharing!! 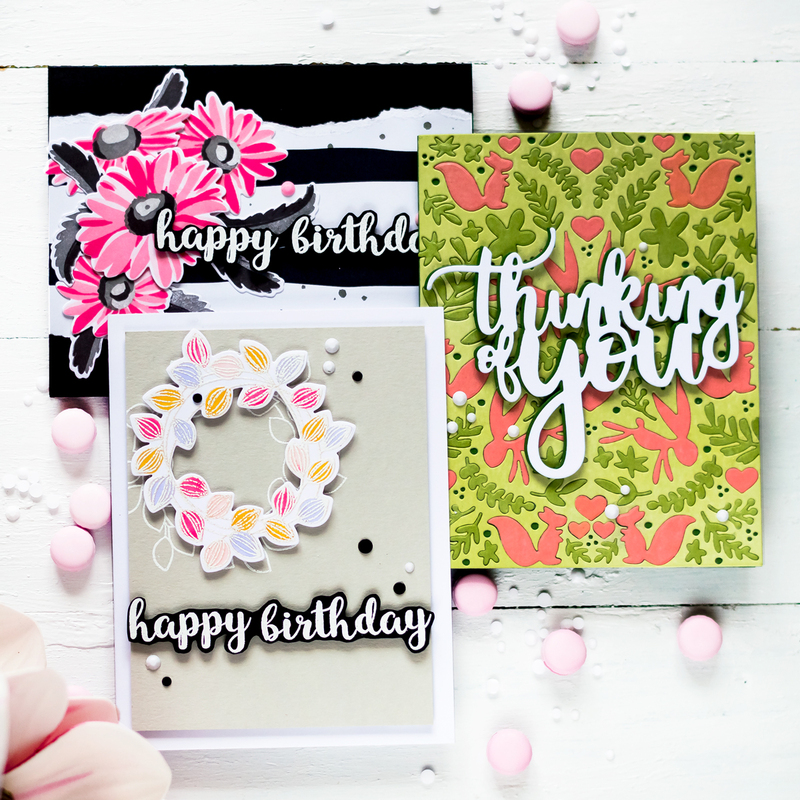 Beautiful cards and floral dies! All three cards are so striking and beautiful! Love the metallics and the kraft, white and vellum for a softer look. Thank you for the beautiful cards and explaining just how you used the white embossing on the vellum flowers, I have wanted to try it but have been hesitant. They are all beautiful! I love the dark blue card! What a gorgeous color. 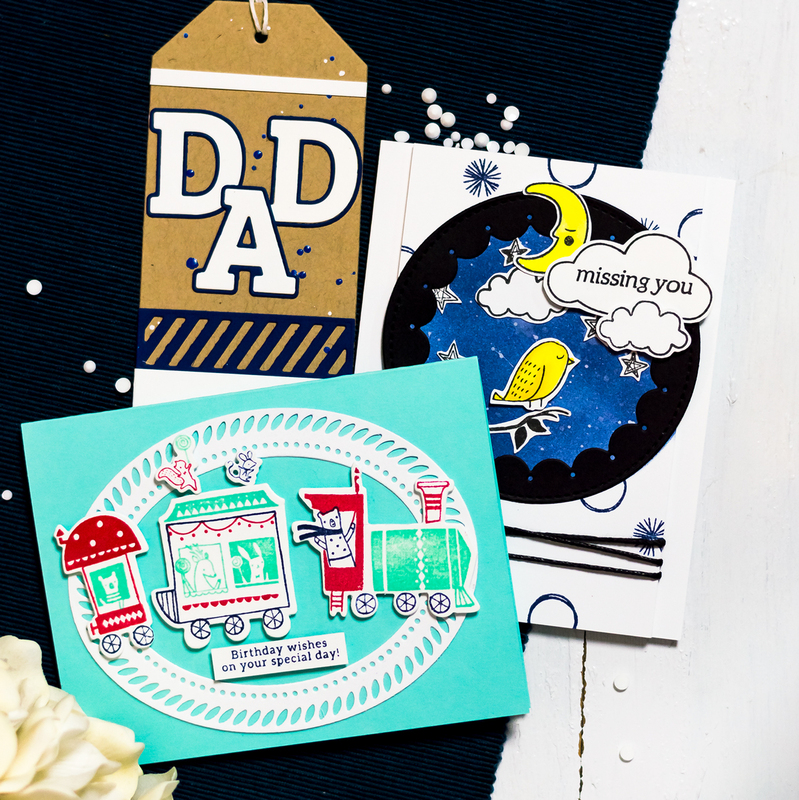 Love how you used the ornamental die cuts on your cards. I like your “corporate” card. The blue and gold is striking. I love the simple layouts for these complex die cuts! Beautiful work! A very elegant card! First I would like to comment on your cards, The first one was STUNNING, I loved it, probable my favorite, but I loved them all! The 2nd was so beautiful, I don’t think it was a corporate card at all, it was way TOO ELEGANT and BEAUTIFUL for that, I just loved it. The third card was awesome and I loved that you used Kraft, not many people use that nowadays but I really love the way it looks when you make a card with it and those poppies in the white just pop and look amazing against the kraft, awesome job. Now for the women who left the comment about not winning gift cards, that was so rude, and I am so sorry she was rude to you!! She doesn’t get that these Blogs you designers work so hard to keep up are NOT about winning prizes!!! They are about people, hopefully friends and talented women sharing that talent with other crafters around the world, so we all can share ideas, designs, what they have learned, what they have made, new products that are out there with different companies and more and sometimes, yes they will have a blog hop to introduce those new products and the companies offer gift cards sometimes, if your lucky you may win, BUT that is NOT what these blogs are about and that was so unfair of you to take your anger out on Svitlana, she has a wonderful blog that we all enjoy and we all subscribe because we feel she is very talented and enjoy seeing her cards and learning from her not to win contest. Beautiful dies! And your cards are elegant! Thanks for sharing. Beautiful cards. The different embossing layers on last card was really effective. Love your first “thinking of you” ! Beautiful cards. The blue and gold card is especially striking. gorgeous! love it and the new die!!!!!!!!!!!! Just beautiful! The Ukraine has a lot of very gifted card makers! Thank you for sharing. Wow your cards are gorgeous. I loved all of your cards. The designs are very elegant. Thanks for sharing. О они такие классные! Мне кажется, такие продукты – это очень твое! Открытки очень эффектны и аж дух захватывают!! Gorgeous cards, simple and elegant. Beautiful cards. Love the colors and clean designs. All three of your cards are BEAUTIFUL, and I love the special creative techniques you’ve shared on each of them. My favorite tip is cutting the die cut on the first to make the label. I love getting extra mileage out of my products, and this is a super idea to do just that. The last card is my favorite…I love the subtle background embossing and kraft and white always looks so elegant! Thank you for sharing your techniques and beautiful inspiration! Oh, and for the giveaway, too! Gorgeous cards! I love the navy and gold combo! WOW Svitlana, these are VERY elegant. 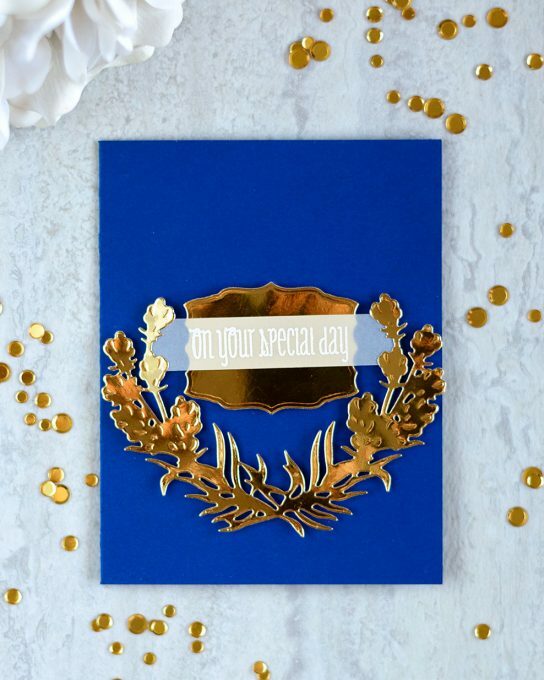 Love how you used the label die on the first one and what beautiful rich blue on your second card and with the gold…ACK! So gorgeous! Of course kraft & white is one of my fave colour combos on a card and add my beloved poppies and you have another winner! Beautifully done on all counts! I’m so new to this and love what I’m seeing thank you for sharing with us. 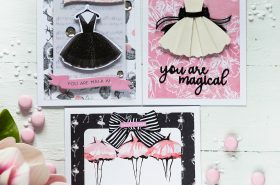 Lovely cards – I want all these dies and my list keeps growing!!! Your color choices are very elegant and the dies are truly beautiful! Thanks so much for sharing and don’t be discouraged by anyone’s comments! Sometimes I do blog hops and sometimes I don’t – sometimes I just look at the designs and don’t make comments if I don’t have time. It’s still wonderful that artists like yourself share what you are making and if you didn’t mention the products you are using, how would the rest of us know about them??? All of your cards are beautiful but I especially like the poppies with the embossing. Thanks for sharing that technique with us. Beautiful cards! I especially like the poppy card and that lovely die. so many lovely card designs. great inspiration! Love your use of colors. Love the use of the tag die for the card! Love what you did, such bold color combinations. I love the Kraft/white combination too. It looks so elegant but takes out the guesswork. TFS! Oh I love the Kraft Card. So simple and simply elegant. Such beautiful designs! Thanks for the opportunity to enter! I love the simplicity of the embossed flowers on the kraft. To me that design is always so elegant. Your corporate card is fantastic. Regal and pretty. Your cards are just amazing! And the dies you choose to work with are just awesome !! Great cards! 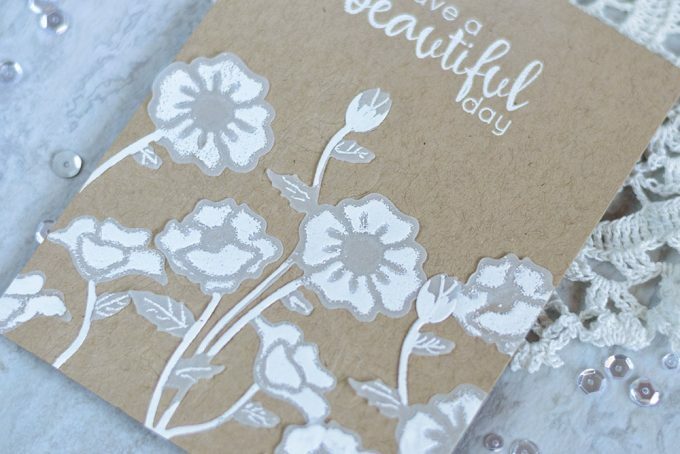 I love the vellum flowers and white embossing on them! 3 beautiful cards; with the kraft card as my favourite. Really beautiful colour, dies, paper, … combination ! Beautiful color choice. Thanks for sharing. Nice cards! I need to try the embossing on vellum – thanks for sharing! Very CAS and classy all at the same time! These are very beautiful elegant cards I love them all. Thank you for sharing. Wow I love all of them. You create amazing pieces. So many elegant cards!! 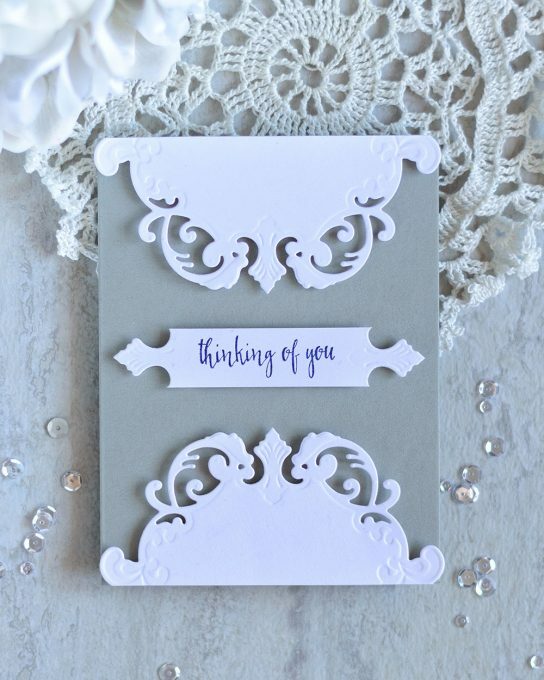 Hard to pick a fav, but I think mine is the gray and white Thinking of You card! Wow some beautiful cards but that last one is my favourite! I’m a big fan of white and vellum on kraft. You can never go wrong with it. Love it!! Hi! I love the cards you make – very inspiring! I love using Altenew stamps – they are my favorite! Your cards are so elegant and so gorgeous! You really used those new dies beautifully! I just love these! Thank you so very much for your inspiring post- hope to be back again! Gorgeous cards, I especially love the last one. Thanks for sharing. Your work is so unique and beautiful. It’s also very inspiring. Thank you for sharing! Three totally different cards. Each of them showcasing the dies perfectly. Not sure which is my fave but I am drawn to the first one. It is so very elegant. Thanks for sharing. Wonderful cards. Love them all! The last card with the white embossed vellum is amazing. I love that you paired that soft, elegant look of the vellum with the kraft cardstock. This is definitely something I want to try.